The Very Hungry Caterpillar is a children picture book written by Eric Carle. 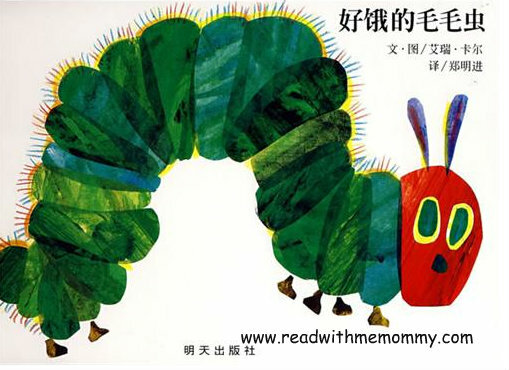 The book follows a caterpillar's life journey as it eats its way through a wide variety of food before emerging as a butterfly. This book is one of the greatest childhood classic of all time. The English version has sold more than 30 million copies worldwide. The book starts with an egg on a leaf, in the light of the moon. The sun comes up and a tiny caterpillar emerges and looks for food. On consecutive days, the caterpillar eats through a single red apple, two (green) pears, three (blue) plums, four strawberries, and five oranges, which takes us from Monday to Friday. On Saturday, the caterpillar eats its way through many different foods: chocolate cake, ice-cream, a pickle, Swiss cheese, salami, a lollipop, cherry pie, a sausage, a cupcake, and a slice of watermelon. He got a stomach ache as a result of eating all his food. On Sunday, the caterpillar eats through a single leaf, which makes him feel better. The now big caterpillar forms a cocoon. On the final pages the caterpillar is now a 'beautiful' butterfly. This book is one of the must-have in your kid's home library! Available in hardcover and in simplified chinese. 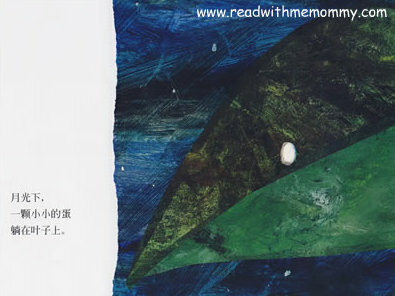 If you like Eric Carle's book, you may like to consider The Tiny Seed [小种子], Brown Bear, Brown Bear, What Do You See [褐色的熊，褐色的熊，你在看什么]. All available at our store.